← Carlton Bolling College – Bringing Everyone Together! ‘Leading on Literacy’ Festival aka ‘LOL Fest’! We are very excited about our upcoming ‘Leading on Literacy Festival’ which is happening at the end of term. LOL Fest is happening after exam week, starting on the 6th of July with the celebrations and winners events occurring the week after. It’s a really nice way to finish the year, with a whole school fun event during the last two weeks. Monday 13th July session 6 – Y9. Tuesday 14th July session 6 – Y8. Wednesday 15th session 6 – Y10. Thursday 16th session 6 – Y7. Posted on June 8, 2015, in Uncategorized. Bookmark the permalink. 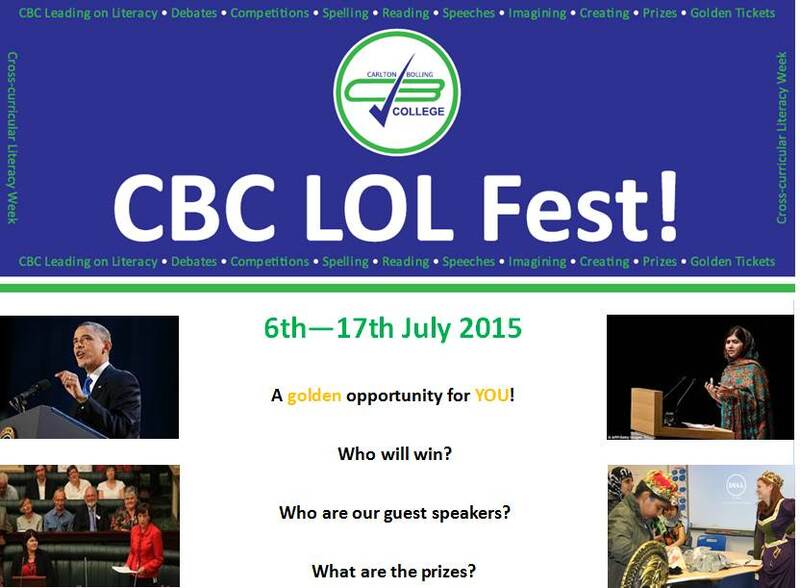 Comments Off on ‘Leading on Literacy’ Festival aka ‘LOL Fest’!.